With a mix of relatively well–known modern jazz tunes and originals, innovative electric guitarist Gary Schwartz has recruited two of the more interesting and inventive younger Montreal musicians for this delightful collaborative effort. This session pleasurably engages, with Schwartz leading the way, with saxophonist Alexandre Côté and the endlessly curious drummer Jim Doxas on 12 tunes. While Schwartz, who is active on the local scene and a part-time faculty member at Concordia University, is usually associated with more Out There jazz — such as his remarkable big-band reprise of Ornette Coleman material — this outing begins with three post-1940 jazz standards: Close Your Eyes, Monk’s Dream, and You Stepped Out of a Dream. follows each piece, offering melodic, rhythmic, and tonic surprises. accents. You Remember Me is Côté’s faster tempo tune, a vehicle for his roaming solo punctuated by Doxas’s pulse. Schwartz introduces the closing Spaceman on the Beach, with a Latin beat and ironic flavor. Suddenly a change of pace leads to an unexpected ending. The final bridge is a short, free form collaboration — thoughtfully closing an engaging session. 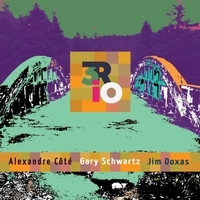 Be the first to comment on "CD review: 3RIO, by Gary Schwartz, Alexandre Côté, Jim Doxas"